Amazon’s Alexa has been the default tool for website ranking for what feels like forever, and although services like Compete and Quantcast offer alternatives, nothing has come close to usurping Alexa as the go-to tool for anyone wanting to compare their global traffic with that of a rival. 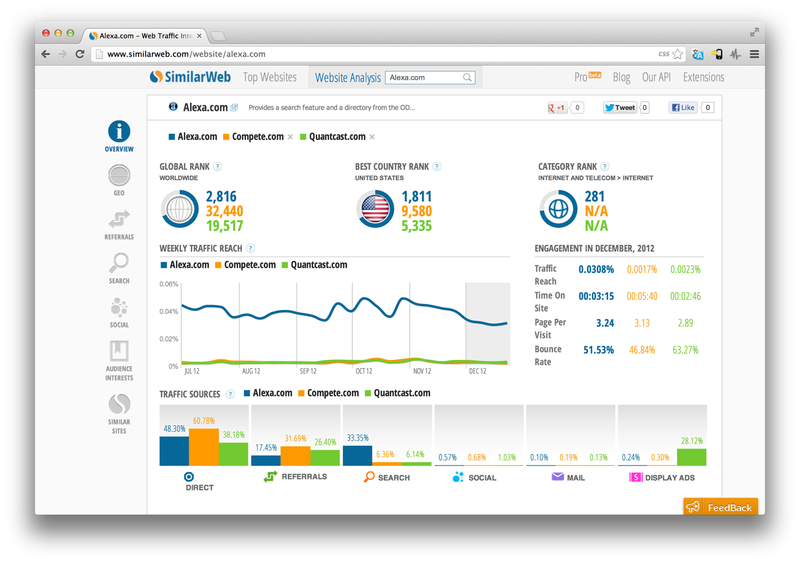 SimilarWeb has recently launched with the aim of doing just that. 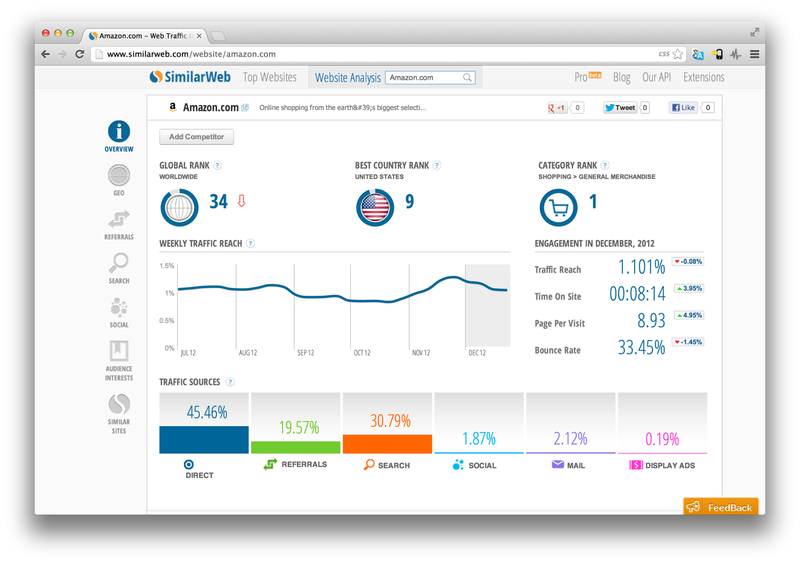 SimilarWeb comes from an Israeli team that has produced a range of browser plugins such as SimilarSites in the past four years. Now, using data collected from the total install base of “tens of millions” of these plugins, the company is offering its own tool to analyse the traffic of any website. Why use this rather than Alexa? Well, SimilarWeb offers more fine-grained data, such as a percentage breakdown of different traffic sources (so you can see what proportion of visitors came via social shares, email, search etc); engagement levels by users in different countries; the most popular specific referring sites and destination sites resulting from links to and from the site in question, and rankings of websites by category and country. Oh, and it also looks a darn sight nicer than Alexa’s dated interface. As you’d expect, you can run comparisons of sites, viewing data for up to three sites together if you choose. Of course, the first thing you do when you try a service like this is to test it with your own website. SimilarWeb’s data for The Next Web doesn’t quite mirror the data we receive from our own analytics packages (although there’s an upward trend in both), but as with Alexa data, SimilarWeb information can only ever be indicative of trends, not taken as gospel. SimilarWeb is currently completely free, although a paid-for Pro version will be added in coming months, offering extra features. It’s good to see someone looking to topple Alexa with a fresh take on website ranking, and if the SimilarWeb team keeps developing their product in the face of an increasingly stale incumbent rival, maybe they might succeed.